The narrator is writing a confession of sorts explaining why he killed Edward Pickman Derby. He claims that it was not his fault and that his tale will explain everything in this strange case. He starts by explaining Edward's childhood and their meeting. The narrator, Dan, explains that he first came to know Edward when he was eight and Dan was sixteen. The boy wrote deep and dark poems that intrigued Dan and so he became mentor and friend to Edward who was a very reclusive boy from a reclusive family in the town of Arkham. Their friendship continues for decades and Edward regularly visits Dan to engage in deeper philosophical discussions. Years later, Edward returns to Mistakonic University and begins to toil in darker and darker exploits. It's at this time that he also meets Asenath, a woman fifteen years his senior who eventually becomes his wife. She is from Innsmouth and from an archaic and mysterious family there. They move in together after Asenath's father, Ephraim had passed away and Dan begins to see noticeable changes within Edward. Edward becomes noticeably scared and erratic, while at the same time, the rumors indicate he and Asenath are getting deeper and deeper into the dark arts. He visits less and he is beginning to look less and less like himself. One evening, Dan receives a call to find out that Edward is up in Maine and requesting his help. This is strange because Edward can't drive and it's unclear how he got there. On the drive home, Edward begins to explain that Asenath has found the spell from the Nerconomicon that allows her to possess Edward's body and leaves Edward in Asenath's body. This has been going on for some time and in fact, often, she loses her grip and Edward finds himself in some strange place. Dan continues to be skeptical about this but then witnesses the take-over while driving back. The now-possessed Edward takes control of the wheel and drives them home. For some time after this, Dan doesn't see much of Edward except for one visit where it is clear that Edward is not himself. However, Dan continues to hear rumors. Edward arrives one day and explains that through trickery he has vanquished Abernath (whom he now believes is actually Ephraim, the father) from his body once and for all and she has left for New York. The servants (that were hers) have been sent back to Innsmouth. Later, Dan learns that Edward is still paying them for some reason. Dan begins to make arrangements to move out of the house that they occupied and into his old family estate but he continues to stall. Eventually, he has an entire breakdown and is admitted into an asylum. Though Dan continues to worry, he feels relieved that Edward is being taken care of. However, he receives a call one day that Edward is back to his normal self and that he is likely to be released soon. Dan visits Edward and realizes that this is not the Edward he knows but the faux-Edward he encountered in the car drive. Later that night, he receives a phone-call that came from Edward's old house even though no one is supposed to be there. Later, he receives a visit from a deformed character wearing Edward's clothes who passes him a note. The whole experience caused Dan to pass out several times but by the time he gets to the end of it, he discovers that Edward had killed Asenath but the power of Ephraim was strong and survived death to eventually take over Edward's body. Edward was left to try to use the corpse of Asenath to communicate what had happened. In his letter, he requests that Dan kills the faux-Edward because it may come for him some day. Dan goes to the asylum and kills Edward. 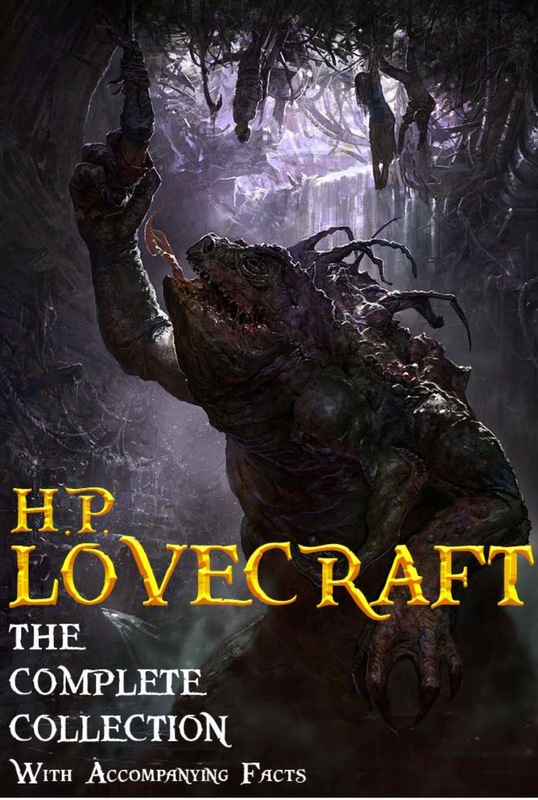 Now this is the Lovecraft that I love to read. I find that his confessional stories are always the most fascinating. In this one, I also found that the levels of madness were well executed. Dan is trying to convince his reader that he is sane for doing what he did and was dealing with potentially less sane people (Edward). It reminds me of Ben Kenobi's point--"who's more the fool? The fool himself or the fool who follows?". That's the best part of Lovecraft and where he at times improves upon Poe. His characters often come across as somewhat--if not entirely--sane for doing what they did, but somehow really do seem insane on some level. I also found the unraveling of this tale well developed. We are initially led to believe that it may be Edward who goes into the dark world but then it is his wife (or his father-in-law, rather) that drags him to horrifying depths.